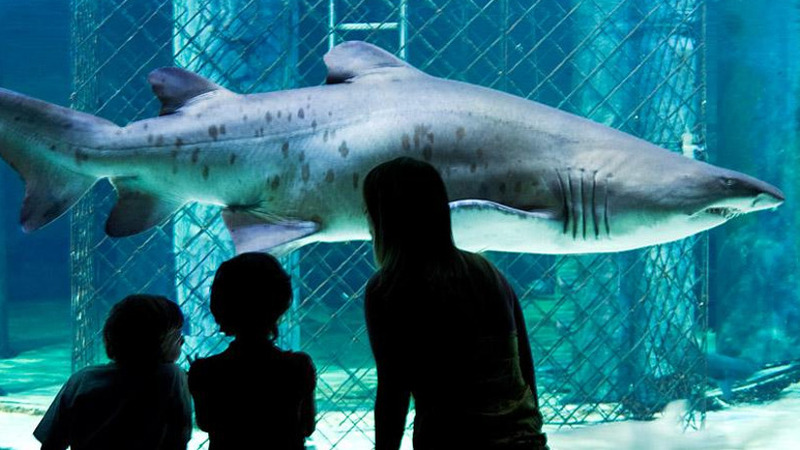 The Cattolica Aquarium is the second in Italy for its size, and every year it welcomes thousands of visitors thanks to its tanks (over 100) that exhibit a wide variety of fish and marine species including sharks, tropical fish, small turtles, and jelly fish in perfectly reproduced habitats. It covers 110 thousand m2 and has indoor and outdoor areas. Though the indoor areas cover most of the surface area there are various outdoor areas where visitors can enjoy their picnics. Four routes of different colours will guide you on your visit. Blue indicates the exploratory tank route. You will literally be immersed in corridors with transparent tanks running along the sides and ceilings in which colourful fish of all shapes and sizes swim. Yellow is for the route that is dedicated to the discovery of streams and rivers, where you can see the caimans of the Amazon River and the otters of the Eastern torrents. At set times during the day along this route you can watch the staff feed the animals, which is a really exciting experience for all our visitors to enjoy. Along the green route the habitat is completely different as it gives way to an exotic landscape that is inhabited by insects, snakes, frogs, and chameleons of various species. While the purple route features the sounds of the sea that are combined into a harmonious melody by Maestro Carlo Guidi. The journey becomes adrenaline-packed when you reach the shark tank; here the bravest visitors can choose to take a dip and enjoy a thrilling experience, a close encounter with the most feared predators of the oceans.